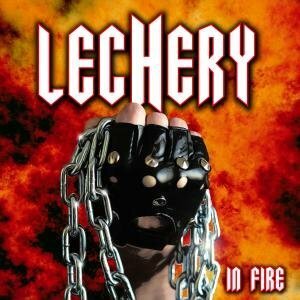 Lechery are a Swedish band dating back to 2004. Before joining Lechery, Martin Bengtsson, the bands lead guitarist and vocalist was a member of Arch Enemy and also played with Christopher Amotts side project Armageddon. "In Fire" is the bands second album - the first, "Violator" was released in 2008 so "In Fire" has taken a while. Recording was delayed due to various reasons including accidents and injuries to band members, but the album is now ready and is due for release at the end of August 2011. This album definitely has a classic rock/metal feel to it, and certainly reminds me of bands including Accept, Saxon, Scorpions and U.D.O. The album starts with the instrumental track "Awakening" which starts off gently with quiet slow build up before the music kicks in with plenty of power and a crash with some nice guiatar work. The album proper kicks off with "Mechanical beast", a superb classic metal track with its pounding drums, screaming guitars and a strong catchy chorus. "Lethal" has a Saxon feel to it at times. Martin Bengtsson has a good voice that works perfectly with these classic metal songs. This album will definitely appeal to fans of the classic German heavy metal bands - Accept and U.D.O in particular, as well as fans of bands such as Saxon and Judas Priest - the album has that classic metal/hard rock feel, but you do need to look beyond the sometimes clichéd song titles and lyrics and instead focus on the music, but then again the same could be said of lots of rock or metal bands over the years - Manowar being the obvious example of over the top clichés. The album cover really doesnt do them any favours - it's the sort of cheap tacky cover you'd expect from a bargain basement "metal" compilation CD rather than a good album from a good band. "In fire" will be released on 29th August 2011 through Metal Heaven.